Not such a good end for the riders that day, hopefully nobody was seriously hurt, and I can bet it was quite a time trying to get it out of there! great post card! I've always been curious as to why accidents or disasters were made into postcards. Guess they make a good visual but not so good for those involved. It makes me wonder how it got into that position. I wonder how it got there too. Have you found a news story to go with it? That might interesting. Well that gave the locals plenty to gawp at and gossip about for a good while I’ll bet. Retrieving the car would have been no easy task either. I hadn't noticed the two girls until I enlarged the picture. and then I also saw all the boys who were clambering through the gap left in the wall. I travelled through Millbrook using Google Streetview (which was fun) but I couldn't find it either. The closest I got was a mention of an accident in Ditchcroft, but I cannot locate this Ditchcroft. Interesting that someone was there quick with a camera to document it and then sell it. It's like one I have a street in San Francisco following the 1906 earthquake. The seller even attached a Chinese coin to the SF card, implying it had been found in the ruins. There's always somebody ready to make a buck. I think that postcards of disasters/accidents like this were a way early photographers could make easy money on something newspapers could not do. A picture worth 1000 words etc. Sold like broadsheets to people who heard about the incident but were not there. I have to confess that the only building I know in Stalybridge is the Station Buffet Bar. I must explain in my own defense that it is such an historic and award-winning buffet- bar. with an unrivaled range of real ale, everytime I visit the town I never leave the station! Wow! Great postcard, although the subject matter is tragic. I hope no one was seriously hurt, but without additional information we can only speculate. At least there's a date on the photo. Good luck finding out more! 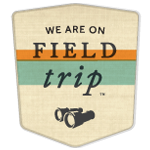 I just discovered your blog and have had such a good time exploring it. Now if you ever find any from Chipping Warden, Northhamptonshire I hope you will let me copy the file. Trams Seemed To Be Forever Crashing! Several Such incidents were also recorded in my neck of the wood (Halifax). Have you ever been to The Industrial Museum in Bradford? they have several trams displayed that you can look at from the inside.Amazing how narrow & cramped they were.They dont look very safe.No wonder they had problems on Hills,Bends & Bridges! You are pretty much spot on with the map. The accident occured in 1908 a few metres to the west of the present entrance to Stalybridge Country Park (at the junction of Huddersfield Road and Hartley Street), Millbrook. The tram was certainly coming from Stalybridge, gathered far too much speed on the steep stretch towards Ditchcroft and went off the rails where Huddersfield Road turns sharply left. The house on the left of the postcard still exists. It is at the corner of Huddersfield Road and Grove Road (on Streetview, a woman and her daughter in red and pink tops are passing in front). The parapet of the bridge is still there too but the ditch itself has been filled up. Sadly it seems one person died in the accident. 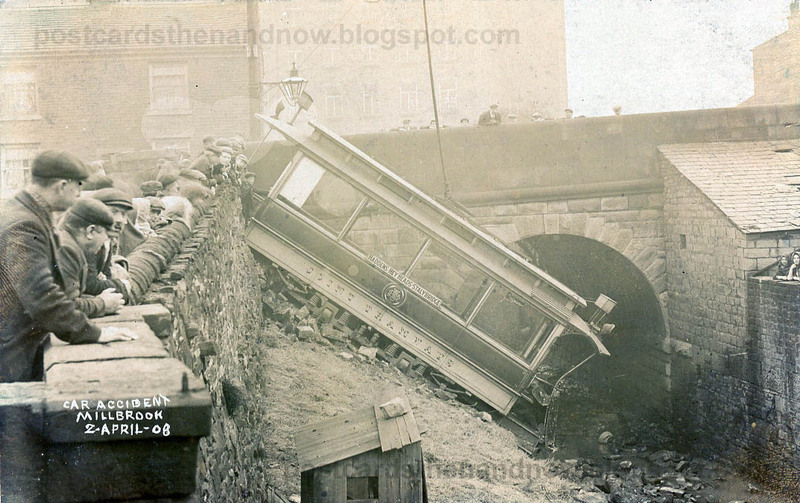 If it is this accident in 1911. The guard, my great grandfather, was killed. Al the other passengers survived. I've added a current photo of the area in Millbrook on my blog at http://cooperfarm.blogspot.co.uk/2012/09/dithcroft.html. As Sebastien says, the accident site is in what is now the Country Park, and the embankment has been filled in. However, if you cross the road and look down from the bridge - you will see how steep the drop is! The mill in the background is no longer there. It was destroyed by fire in (I believe) the '70s. Again a tragic story, as a worker was trapped on the roof and decided to jump before the fire could reach him.